Overseer Network Monitor uses standard Windows system commands to monitor your critical system services on your mission-critical Windows servers and workstations. Most quality system software runs as a service, making it incredibly important to monitor the uptime of these services. Overseer Network Monitoring Software is capable of monitoring Windows Services remotely via standard Windows networking. This allows you to monitor all your critical services from a single monitoring workstation. Overseer is able to attempt to restart services that are unavailable, potentially saving you a trip to the datacenter. If something goes wrong, Overseer will send you a message via Email or text message. Overseer can monitor Windows services on any remote machine that is has the proper credentials for-- all of this without installing an agent on the destination machine. This simplifies setup, enabling you to setup your monitoring system far quicker. Overseer lets you easily pick the service you'd like to monitor from a convenient list. 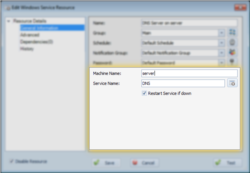 This saves time looking up the service name in the remote computer's MMC, and eliminates the possibility for typos. Overseer can attempt to restart the service, if so configured. This may save you the time of doing so yourself.